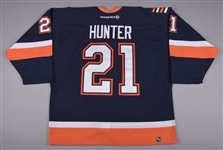 From his second of eight seasons with New York, We have an Islanders jersey worn by winger Trent Hunter in 2002-03. A sewn-down label with “56” sizing graces the collar, with KOHO and NHL crests over the reverse neckline and bottom hem respectively. 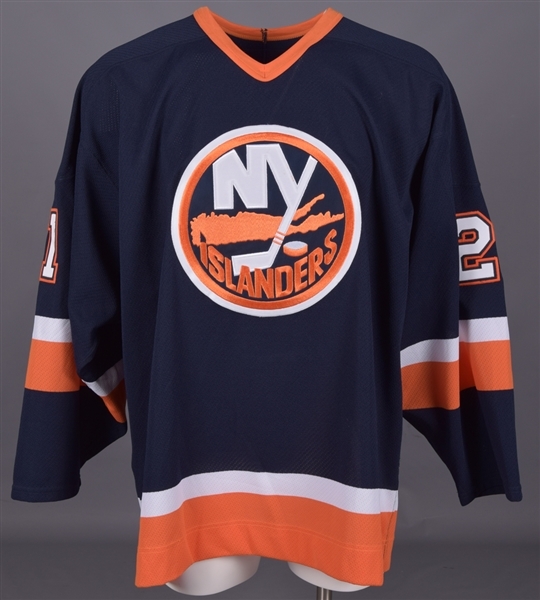 Styled with the familiar Long Island team crest with embroidered detailing, the navy “Set 1” V-neck has been accented with tri-colour tackle twill sleeve and verso numbers, with an alternate patch over the right shoulder. 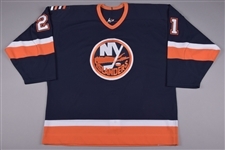 With just a few faint burns and marks present, the jersey remains in wonderful condition. The team patch sits over the inside hem along with an example from MeiGray numbered “A02488”, with a matching LOA to accompany.